Body camera footage of a Baltimore police operation released by the public defender's office appears to show an officer hiding drugs and later discovering them while two other officers watched. "I would say there are hundreds and hundreds of cases directly affected between the two cases," Debbie Katz Levi, director of special litigation for Baltimore's Office of the Public Defender tells NPR. "I think it's safe to say if you included all of the officers, you're probably at around 500 cases." The Baltimore police internal affairs office is investigating. The Baltimore City State's Attorney's office says "we are currently reviewing numbers." "These officers are employed by the Baltimore Police Department. Therefore, it is a problem that BPD must solve," says Caron A. Brace, chief of staff for Marilyn Mosby, the State's Attorney for Baltimore City. "The Office of the State's Attorney believes that this represents a small percentage of officers, and will support the Baltimore Police Department as it works to rectify the issue," Brace says. Baltimore is already under federal scrutiny after seven officers were arrested earlier this year for racketeering offenses, including robbery, extortion, and overtime fraud. When a Baltimore police officer hits record on his body camera the device saves the preceding thirty seconds but without audio. So it's possible the officer in the first video didn't realize he was being recorded when he appears to place a small baggie filled white capsules in a narrow alley's trash-strewn lot. The officer then appears to turn the already recording device "on" and returns to get the drugs allegedly linked to a suspect already in police custody. The audio then kicks in. "I'm gonna go check here," the officer says while one of this two police colleagues appears to laugh. He then easily finds a baggie of drugs in an old soda can. The police department's Media Relations Chief T.J. Smith says the officer whose body camera was recording in the alleyway, Officer Richard Pinheiro, has been "suspended on admin duties," while the two others present in the video are now on "non-contact with the public" administrative duties pending the department's probe. A second video from a traffic stop appears to show Baltimore officers searching a car a second time and finding baggies of drugs that didn't seem to be there during the first search. But public defenders discovered the videos, not the State's Attorney's unit devoted solely to reviewing and disseminating body camera footage. And the police unit charged with reviewing hours and hours of body cam footage also apparently missed the videos. "Who's policing the police and how are these incidents getting past the review unit and the State's Attorney for this many months, only to be brought to light by the Office of the Public Defender?" asks Katz Levi, of the Public Defender's Office. "There's no excuse for it." She says these cases raise deeply troubling questions about what state prosecutors are doing with police body camera evidence before they bring a case to a grand jury. "Are they leaving this out when they go to the grand jury? Those proceedings are secret; we don't know. These two camera footage incidents show us with certainty that incidents of misconduct or alleged misconduct are being missed, so what is the State's Attorney's Office going to do to fix it? What is the police department going to do to fix it?" Mosby's office has also come under criticism because Officer Pinheiro was allowed to testify in a separate case after the video surfaced, which her office chalked up to a timing mishap. "At the end of the day we were in the process of pulling these cases at the same time this case came in," Mosby told a press conference in July. A central issue nationally is when officers turn on and off their cameras. Most departments have clear rules — as Baltimore does — that say body cameras should stay on while they're still at the scene of an incident and only turned off if a member of the public requests it. "We believe that body cameras are a net positive because they show things that we otherwise would not see," says Andrew Northrup chief of the felony trial division in Baltimore's Public Defenders Office. "But at the same time they can't be manipulated. You will need to leave the tape on at all times so that there's no question about what's going on." Nationally, there's a troubling lack of accountability when officers don't follow department body cam guidelines, says Jay Stanley, a Senior Policy Analyst with the American Civil Liberties Union. "Around the country we're seeing big issues in body cameras around access to footage and we're seeing widespread cases of officers not complying with policies," Stanley says. "Not turning their cameras on when they're supposed to be, turning them off too soon, or turning them off in the middle of encounters and not facing any consequences from police management." The National Association of Criminal Defense Lawyers agrees it's a growing issue. "We've seen many moments where at the critical moments that body cameras were rolled out to address and to capture are not ending up on the video," says Jumana Musa, a senior attorney with the NACDL. The group's research, she says, shows that in police departments that have had a troubled history and may be under a consent decree, body cameras have done little to foster reform. "Oftentimes those cameras are only used when they're supposed to be used about one to three times, so 30 percent of the time. So just putting a camera on an officer by itself is not going to be a measure of accountability and is not gonna cure the problems that run deep in the department," she says. "The question of police accountability still is and always will come down to the leadership, the training, the types of people hired, and then the way they're addressed when they're found to be acting outside the bounds of what are their rules, what are the laws, and what are the policies of the department," attorney Musa says. But Baltimore's Police Commissioner Kevin Davis says it's wrong to assume the worst before his investigators are done. Davis says it's all part of the "growing pains" of introducing a new technology just over one year ago. "When those gaps in video footage exists, it's ugly," Davis says. "What was there? I don't know I didn't see it. The camera was on, now it's off. Does that mean when the camera was off there was some kind of criminal misconduct was taking place by police officers? I think that's a conclusion we just can't jump to," he told reporters recently. But the problem has cropped up in cities across the country in police arrests, drug cases and fatal shootings. In Minneapolis this summer, for example, an Australian woman was shot and killed by an officer as she approached a squad car after calling 911 to report a possible sexual assault near her home. The officer's body camera in that case was not turned on, as required by the department. Then there's the critical issue of who gets access to the video and when. 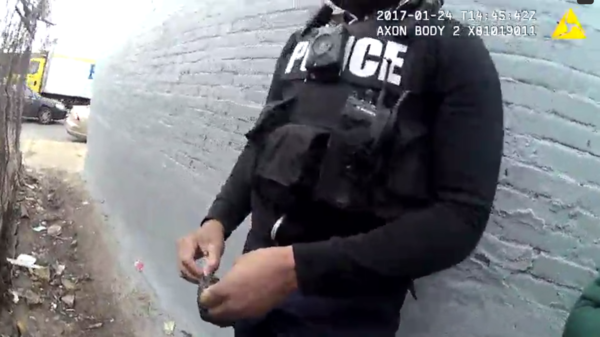 Hundreds of criminal cases in Baltimore are in jeopardy after two incidents picked up by police body cameras show officers allegedly planting drug evidence. So far more than 40 criminal cases have been dropped because of the videos. The cases mostly involved drug- and weapons-related felonies. Public defenders say hundreds more could end up being dismissed. Police and the state's attorney's office in Baltimore are investigating. The cases also bring up larger questions about the use of police body cam video. NPR's Eric Westervelt has our report. ERIC WESTERVELT, BYLINE: When a Baltimore police officer hits record on his body camera, the device saves the preceding 30 seconds but without audio. So it's possible the officer in the first video didn't realize he was being recorded when he appears to place a small baggie filled with white capsules in a trash-strewn lot between homes. He then turns the already recording device on and returns to get the drugs allegedly linked to a suspect already in custody. The audio kicks in as his two police colleagues appear to laugh. RICHARD PINHEIRO: I'm going to go check here. Hold on. WESTERVELT: And a second video from a traffic stop appears to show Baltimore officers searching a car a second time and finding baggies of drugs that didn't seem to be there during the first search. UNIDENTIFIED OFFICER #2: Oh, yeah, oh, yeah - oh, my God, I knew it. WESTERVELT: But public defenders discovered the videos, not lawyers in the state's attorney's unit devoted solely to reviewing and disseminating body camera footage. They apparently missed the videos, as did the police unit charged with reviewing hours and hours of body cam footage. DEBBIE KATZ LEVI: Who's policing the police? And how are these incidents getting past the review unit? There's no excuse for it. WESTERVELT: That's Debbie Katz Levi, the director of special litigation for Baltimore's Office of the Public Defender. Katz Levi says these cases raise deeply troubling questions about what state prosecutors are doing with police body cam evidence before they bring a case to a grand jury. KATZ LEVI: Are they leaving this out when they go to the grand jury? Those proceedings are secret. We don't know. These two camera footage incidents show us with certainty that incidents of misconduct or alleged misconduct are being missed. So what is the state's attorney's office going to do to fix it? What is the police department going to do to fix it? WESTERVELT: The police say the internal affairs division is investigating. The Baltimore City State's Attorney's Office says the three officers in the first video are involved in at least 123 criminal arrests. Several dozen of those so far have been dismissed. The public defender's office says it thinks hundreds of other criminal cases may be tossed as well. A central issue nationally is when officers turn on and off their cameras. Most departments have clear rules, as Baltimore does, that say body cams need to stay on while they're still at the scene of an incident and only turned off if a member of the public requests it. But there's a troubling lack of accountability when officers don't follow those guidelines, says Jay Stanley, a senior policy analyst with the American Civil Liberties Union. JAY STANLEY: Around the country, we're seeing big issues in body cameras around access to footage. And also, we're seeing widespread cases of officers not complying with policies, not turning their cameras on when they're supposed to be, turning them off too soon or turning them off in the middle of encounters and not facing any consequences from police management. WESTERVELT: But Baltimore's police commissioner, Kevin Davis, says it's wrong to assume the worst before investigators are done. Davis chalks it up to growing pains of introducing a new technology just 14 months ago. COMMISSIONER KEVIN DAVIS: When those gaps in video footage exist, it's ugly. What was there? I don't know. I didn't see it. The camera was on. Now it's off. So does that mean that when the camera was off, some type of criminal misconduct was taking place by police officers? I think that's a conclusion that we just can't jump to. WESTERVELT: But the problem has cropped up in cities across the country in police arrests, drug cases and fatal shootings. In Minneapolis this summer, an Australian woman was shot and killed by an officer as she approached a squad car after calling 911 to report a possible sexual assault near her home. The officer's body camera was not turned on as required by the department. Eric Westervelt, NPR News. Transcript provided by NPR, Copyright NPR.